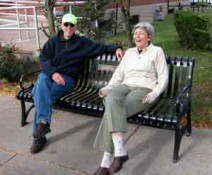 Ray and Ute Duncan enjoying the bench by the post office that they donated through the "Sitting Pretty" program. "Howdeee", the nine-foot tall sculpture by Bill Stewart commissioned by the proceeds of the first of two Stone Soup Auctions. "Les Racines et les raisons" by Jennifer Hecker; a second Stone Soup auction raised the funds for this project. 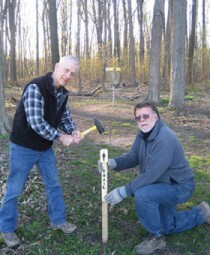 Peter Randazzo and Dave Ball pounding in a trail marker for our Sweden Community Park trail. When a need is perceived, the Walk! Bike! Brockport! 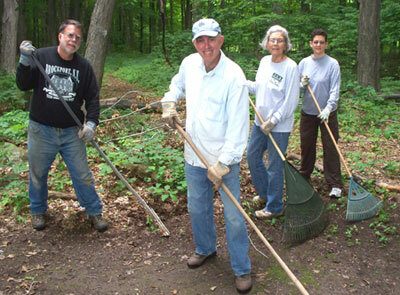 Action Group engages in fund-raising activities to support a variety of projects that are designed to enhance the enjoyment that hikers, bikers and boaters can experience in and around Brockport. The camera icon indicates projects that are represented in our photo gallery. Walk! Bike! Brockport and Village of Brockport Mayor Margay Blackman applied for and received a $50,000 grant from the Monroe County Genesee Transportation Council to develop a "Master Plan for Pedestrian and Bicycle Traffic" in the greater Brockport area. A consulting firm has been hired -- along with a Project Director -- to design this plan. The project will be carried out between August 2014 and August 2015. Once the project is completed, a subsequent grant will be pursued to implement the Plan -- which will include new biking and pedestrian lanes, safe intersection crossings, new signage and other improvements. Walk! Bike! Brockport! received a $10,000 grant to design and implement new "Safe Routes to School" infrastructures. This project is currently being pursued under the direction of Dr. Jim Goetz. 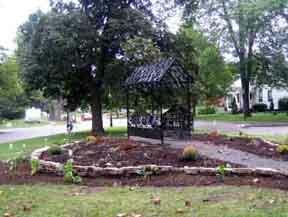 A working committee, spearheaded by Kendra Gemmett, Helen Smagorinski, Deanna Shifton, Alicia Fink and Lori Skoog, after extensive research, has identified the perfect Victorian bench for Brockport's Main Street. Thus far, 42 of these Victorian benches have been purchased by individuals in memory of loved ones or simply as a present to the village. The benches are now making their appearance on Main Street between the canal and the Strand Theater and along the Canal path between Main Street and Park Avenue. The "Sitting Pretty" project has been the subject of feature articles and interviews that have appeared in the Rochester Democrat and Chronicle, Brockport Post and Suburban News. The benches offer a chance for everyone - young families, students and senior citizens - to socialize, relax and enjoy our historic village setting. In keeping with Brockport's unique Victorian character, the benches will dramatically enhance Main Street's distinct architectural flavor. Those who wish to purchase a bench as a memorial may have a tastefully engraved plaque attached to the bench. The Trails Development Committee of Walk/Bike Brockport has established a hiking trail along the perimeter of Sweden Town Park located just off Redman Road. This trail, approximately two miles long, is available for a wide variety of other outdoor sports including, but not limited to, walking, hiking, snowshoeing, and cross country skiing. 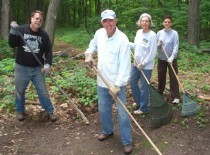 Volunteers will help maintain the trail by raking leaves, moving rocks and logs, replacing trail markers and other work deemed necessary. If you would like to help, please contact Walk/Bike Brockport through this web site.